Coagulation of blood is an important defensive mechanism in both vertebrates and invertebrates that prevents the loss of blood and introduction of disease-causing microbes into the body. While blood clotting follows the same basic sequence in all vertebrates, from the primitive fishlike jawless lamprey to mammals, the number of components associated with the clotting process increases and becomes far more complex as we move up the evolutionary scale. Blood contains three types of cells: red blood cells (erythrocytes) that transport oxygen; white blood cells (leucocytes), involved with combating infection; and platelets (thrombocytes), involved in blood clotting. Injury to a blood vessel in mammals initially causes a spasm and constriction of the blood vessel followed by activation of platelets, forming a plug to stem blood loss. The platelets also activate a cascade of multiple clotting factors leading to the generation of thrombin and the formation of a fibrin clot that stabilizes the platelet plug and arrests blood loss. The multiple roles of the platelets in the clotting process were first described in 1882 by Giulio Bizzozero. In 1905, Paul Morawitz assembled the then-known clotting factors (including the four he had discovered) that lead to the formation of thrombin and the fibrin clot. This compilation continues to serve as the basis for following the process by which clotting occurs. From the 1940s into the 1970s, additional clotting factors were identified—now numbering thirteen and designated by Roman numerals—as well as additional cofactors and regulators required for normal coagulation to occur. A deficiency of clotting factor IX is responsible for hemophilia B, a genetically determined disorder that afflicted members of European royalty who were descendants of Queen Victoria. Factor IX, or Christmas factor, was discovered in 1962 and named after Stephen Christmas, who was lacking this factor. In invertebrates, clotting factors have been identified in such arthropods as the horseshoe crab and crayfish. In some invertebrates, spasms of blood vessels are sufficient to stop the flow of hemolymph—a fluid analogous to blood and interstitial fluid in vertebrates that directly bathes the cells in arthropods and most molluscs—from wounds. SEE ALSO: Arthropods (c. 570 Million BCE), Blood Cells (1658), Hemoglobin and Hemocyanin (1866), Blood Types (1901). 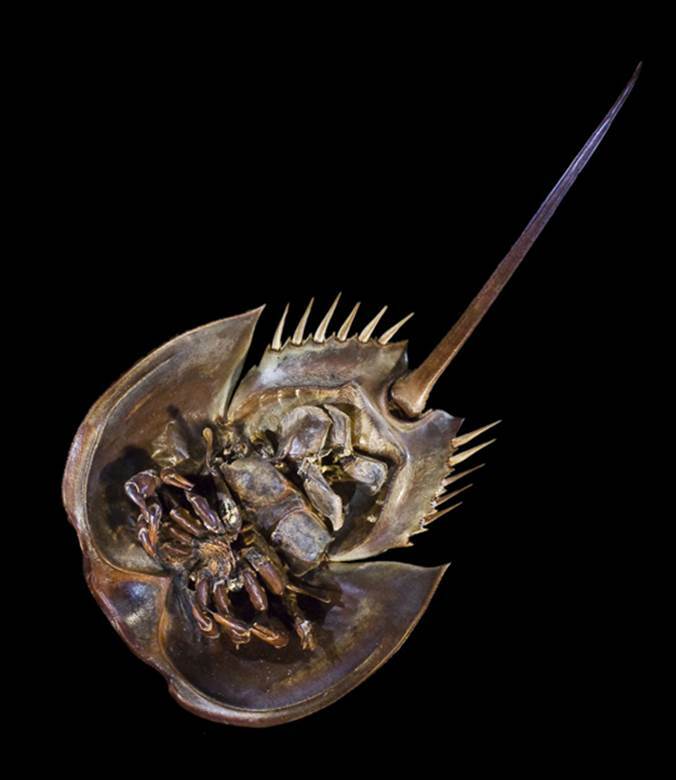 An underside view of an Atlantic horseshoe crab (Limulus polyphemus). Their blood contains hemocyanin, giving it a blue color, as well as amebocytes, which can be used to detect bacterial endotoxins in medical devices, vaccines, and drugs.